Make sure your dog is wearing a protective vest, both for warmth and protection, anytime the dog may encounter ice. Besides the obvious dangers of breaking through a hole and drowning, jagged ice can injure a dog. Never send a young pup out on ice your not absolutely sure of. A young dog's coat isn't thick enough yet, and if a pup has a bad initial experience with ice, the dog may refuse to retrieve on it later. Always do your ice work in a controlled environment. Have your waders on, know how deep the water is, and be able to go get your dog if you need to. If you're not sure about the water depth, don't send the dog. Dogs can sense cracking ice. If your dog is hesitant about going out on the ice or letting YOU go out on the ice, trust him, his instincts maybe telling him its not safe. Observe the ice. Look at the ice to see if you can see any cracks, breaks, weak spots or abnormal surfaces and to identify the color(s) of the ice. You cannot rely on your eyesight alone. This is just an initial look to help you to decide if it is even worth proceeding to the next step of testing the ice. Flowing springs under the ice in spring fed ponds and lakes. Remember this ditty: "Thick and blue, tried and true; Thin and crispy, way too risky." Light gray to dark black - Melting ice, occurs even if air temperature is below 32°F (0°C). Not safe, its weak density can’t hold a load, stay off. White to Opaque - Water-saturated snow freezes on top of ice forming another thin ice layer. Most times it’s weak due to being porous from air pockets. Blue to Clear - High density, very strong, safest ice to be on if thick enough, stay off if less than 4 inches (10 cm) thick. Mottled and slushy or "rotten" ice - not so much its color but its texture. This ice is thawing and slushy. It is deceptive - it may seem thick at the top but it is rotting away at the center and base. Most prevalent in spring, may be showing signs of browns from plant tannins, dirt and other natural materials that are resurfacing from thawing. Not suitable for even a footstep. Remember: Assume NO ICE IS SAFE. 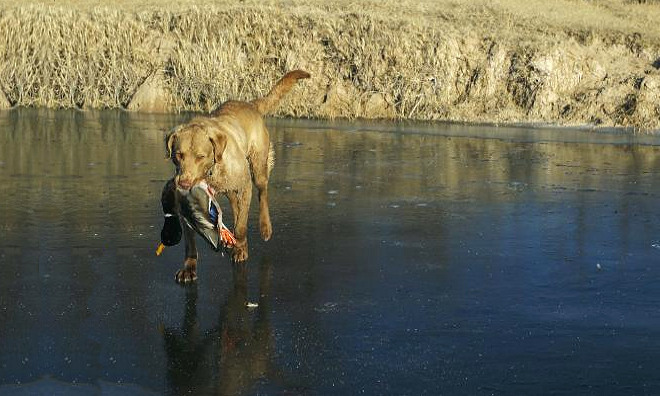 The dangers of early & late-season ice touches on an issue and a question of responsibility that - if you hunt ducks with a dog - you will at some point be confronted with: when is it too dangerous for your dog to hunt? Waterfowlers who often hunt in extreme conditions ask a lot of their dogs, and almost without exception, be they labs, chessies, goldens, spaniels, whatever, they obey without hesitation. They don't question your decision. Personal safety or self-preservation are not issues with which duck dogs bother themselves. You say go, they go. But in doing so, our dogs are quite literally putting their lives in our hands. That's a huge responsibility. Most duck hunters generally hunt without regard to weather or temperature, and expect their dogs to do the same, sometimes in pretty brutal conditions. But you should know their limits - and yours - try to never put them in a situation they cant get themselves out of. This applies to upland hunters also. Farm ponds can be just as dangerous as a duck marsh. It also makes some of your training commands very important so that you can stop your dog from retieving a bird on the ice or just taking a short cut across a pond.